Life Audit: Where am I now? I know I have been a bit quiet and there has been a bit of a gap between blog posts. That is because I have been doing a life audit. Early in December I took sick – a combination of things. It was a real large bump in the road as I realised that I could no longer work full-time. I have been working since I turned 16. I had a Saturday job in a shoe store and then worked my way through college. After graduating I started working and to be honest I have never stopped. I even cut my maternity leave to a couple of weeks as I was working for myself. Not working has been quite some adjustment, and something that has taken some time to get used to. I love being busy and really relish a busy mind. My body unfortunately doesn’t agree. A recent diagnosis of Fibromyalgia on top of the other health issues I have been fighting was literally the straw that broke the camel’s back. My quote this week says it all really. I would really like to thank my friends and family who have been incredibly supportive. They have guided me to take stock. To do a life audit. What can I do, and what can’t I do. What skills do I have and what skills can be transferred. One friend told me to consider myself a client and look at myself as a product. What are the good things about me and where are my weaknesses. I have been doing just that, taking stock and doing a life audit of myself. Figuring out what I really want and how to achieve it. It takes some time to get used to what you no longer have to do. I finally switched off my morning alarm and am letting myself wake up naturally. I am still a morning person, but it is a relief not to be wakened by beep beep beep at 6.30 in the morning. Of course my active mind is exploring new opportunities. I have a few ideas I am playing with in my head and hope that I will find some great opportunities to volunteer in the future. I am excited as my knowledge grows and hope to use my new skills in a part-time capacity in the future. 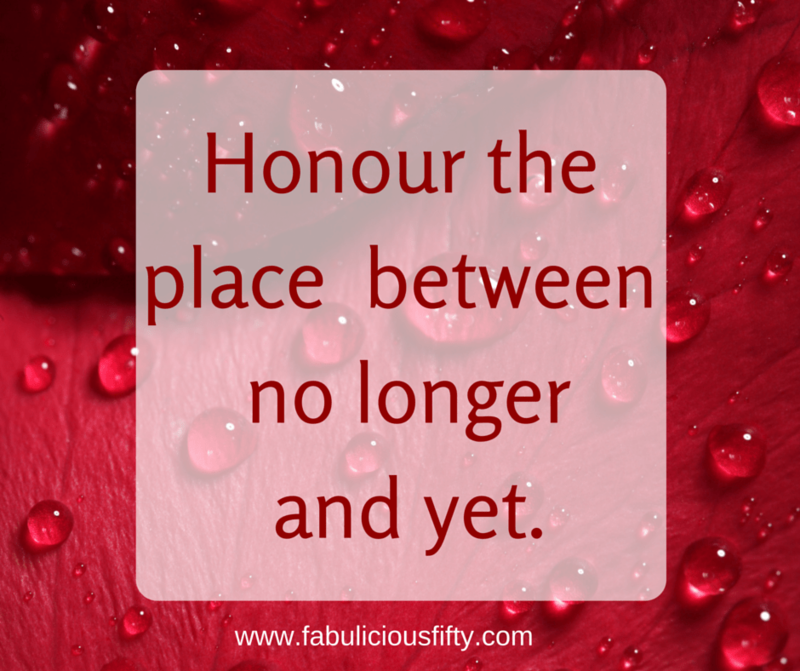 For now though I am in the middle – honouring the place between no longer and yet. I sincerely want to thank everyone that reads my blog and gives me feedback. The one thing that I have realised is that I love blogging and will continue to blog and hopefully inspire. Hi Louise, Thought I had replied. Yes this hamster is getting used to the bottom of the cage – quite restful here.